The Caroline Raspberry will grow almost anywhere, including the South! It's an everbearing raspberry, which means it will produce one crop in early summer and one crop in the fall. Each bright red berry is large, round, firm and juicy, making them exceptional for jams or reductions swirled into homemade ice cream, or for baking muffins and other sweet treats. Be sure to give Caroline organic, well-drained, slightly acidic, sandy loam soil to grow, in full sunlight to partial shade. 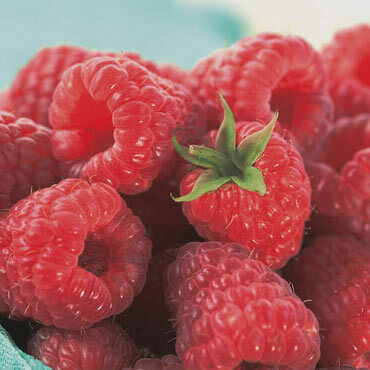 This hardy raspberry is tolerant to root rot and has a high resistance to gray mold. Self-pollinating. No. 1, 1-year. plant. Zones 4-9. U.S. Patent No. 10412. Potted Plants. Soil Preference: Organic, well-drained, slightly acidic, sandy loam soil.